This VEGAN POTATO SALAD is a quick and easy recipe, using avocado instead of mayo. It's oil-free, and I love how you can't taste the avocado at all! Add an inch of water to a sauce pan and arrange a steamer basket inside. Place the potatoes in the steamer basket, then bring the water to a boil over high heat. Once boiling, lower the heat and cover, allowing the potatoes to steam until just fork-tender, about 10 minutes. 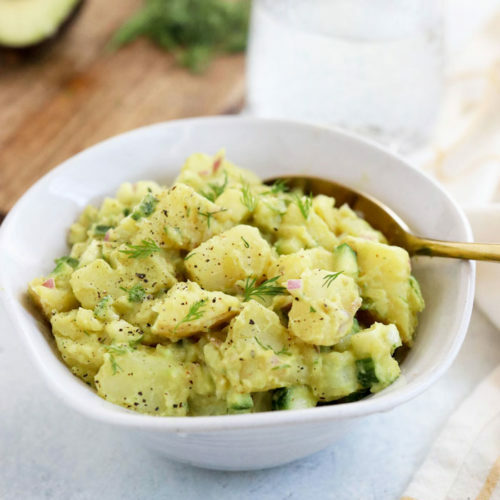 While the potatoes are cooking, combine the avocado, 2 tablespoons of water, mustard, lemon juice and salt in a medium bowl, and mash well with a fork. This mixture will be on the acidic-tasting side, until you mix it with the potatoes, but feel free to adjust any flavors to suit your taste. For a more "Southern-style" potato salad, try adding a touch of maple syrup for sweetness. Allow the steamed potatoes to cool for at least 20 minutes (preferably in the fridge to speed things up), then gradually add the cooled potatoes to the creamy avocado sauce. Stir gently to coat well. Place the potato salad in the fridge to marinate for at least an hour, so it can completely cool and the flavors can meld. Serve chilled, and store the leftovers in the fridge for up to 3 days.